Wicker furniture is a fabulous choice for a bathroom, bedroom, living room or dining room space. The Vintage Grey Range would make a stunning addition to any vintage, shabby chic, rustic or Scandinavian style home. Each piece has a pale grey painted finish, vintage style cupped metal handles and lined wicker basket storage drawers. 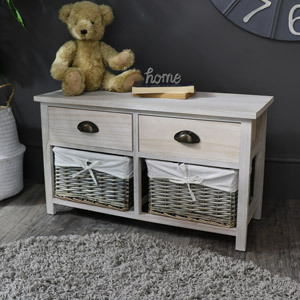 The Vintage Grey Range includes a 4 basket 2 drawer storage unit, a 2 basket 1 drawer side table and a 2 basket 2 drawer bench unit and each item would fulfil any storage needs. View the full Vintage Grey Range and find the perfect piece for your living space. All Melody Maison Furniture items are finished to perfection, crafted with care and made from quality materials.